The renovation of our Chapel began with Gregory Treloar who was resident here last year and is now at seminary. He redecorated the apse and applied the inscription. He also modified an altar we were given to make it the right size for our use and varnished the new Ambo and the new plinth for the statue of Our Lady. He took up the sanctuary carpet and sanded and sealed the floor. Since then others have finished the work which was necessarily left undone as he headed off for seminary. The final touch has been the arrival of a new altar cloth made specially for our altar. It picks up the inscription "Duc in altum" ("Put out into the deep") and has a ship representing the barque of Peter. The gold thread matches the gold lettering round the sanctuary. Last Thursday we were at Portsmouth Cathedral to help out at an adult formation evening organised by Hannah Vaughan Spruce. The occasion was a talk given by Jeff Cavin, an American Scripture scholar, who has been touring England recently. Hannah wanted to ensure the evening had a "new evangelisation" dimension and so she asked us to help by leading the people in prayer and song. We were impressed so see over two hundred people, many of them young adults, turn out for a great evening in which Jeff spoke about his journey away from the Catholic faith into evangelical Christianity and then his gradual reversion to the Church through scholarship. Jeff, who was once an evangelical minister, has developed a really useful study guide to the scriptures called "The Bible Timeline", as well as a shorter introductory one called "A Quick Journey through the Bible". We will be using some of his materials for our own formation next term. Another course at the Vocations Centre is the introduction to sacred scripture given by Fr Joe Evans. Fr Joe has covered questions such as the nature of revelation, the historicity of the bible and questions raised by modern exegesis. Like all our teachers he has proved very popular with the team. Fr Joe is also a university chaplain and, in our get-togethers after lunch, has been able to give us some great insights into that rewarding - and important - ministry. A couple of weeks ago I was away in Rome for the Vocation Directors' Conference. It was a very good week with lots of opportunities to share experiences and to learn from each other. We also had a chance to visit the Italian National Vocations Service where we received a warm welcome. It was interesting to see how things are done differently over there where the approach to vocations work is much more 'top down' with the central office producing materials that are then filtered down to regional, diocesan and local vocation centres. While I was away the team here at the Vocations Centre made use of a bit of extra time to get on with some maintenance work. One task was to finish painting the ceiling of the Chapel. We have now totally redecorated the Chapel and the transformation is amazing. The ceiling was white before but is now an attractive sky-blue with the beading picked out in gold. The photo below shows the work in progress. While one team was working on the Chapel another was outside. The dining room had a leaking roof which one lad was able to fix by replacing the roofing felt. Meanwhile Tony got to work on the statue of Our Lady which had come to Whitstable when the Marcy Convent in Guernsey closed down. It is a lovely terracotta statue which at some stage had been whitewashed. Over the years other coats of paint were applied to it so that the details were now pretty well lost. The paint was flaking and something needed to be done so we decided the first thing would be to strip off all the layers of whitewash and bring it back to its original state. It is still a work in progress but once it is complete we will decide whether to keep it as a terracotta statue or apply a single coat of whitewash to it. These maintenance projects take time but they are important for us to do partly because we have no budget for someone else to do them but also because they are a good way for us all to take responsibility for the house and to enjoy some manual labour together. At the Vocations Centre we live quite a tight daily schedule. Tuesday is a "house day" when we take on very few external commitments and can dedicate more time to ourselves. Once a fortnight Fr Terry Martin comes over to give a spiritual input to the students and also to hear confessions and offer spiritual direction to those who would like to speak with him. Apart from that the other days are available for apostolic activities and / or formation classes. So it is quite important that we build in some 'down time' together which we do by scheduling in excursion days. One such day took us to the beautiful town of Rye where we had an enjoyable lunch and then took the opportunity to explore the town, looking out for the homes of its famous inhabitants. We also called in on the local Catholic Church to visit the Blessed Sacrament and where - to my surprise - I discovered that Rye is not actually in Southwark at all. It was annexed in the great divide by Arundel & Brighton. Even Nemo was left growling when he was told by a local canine. On Thursday and Friday last week we were able to welcome Archbishop Peter to the Vocations Centre. He was accompanied by Bishop John Hine, Bishop Pat Lynch and Bishop Paul Hendricks, the auxiliary bishops of the diocese, and also by Fr Paul Mason the new Episcopal Vicar for Kent, Mgr Matthew Dickens the Vicar General and also the Archbishop's Secretary, Fr Philip Glandfield. They came for an extended meeting of the Archbishop's Council which discusses all the major issues of the diocese and decides on things like parish moves and diocesan appointments (and many other things besides one imagines). It was a good opportunity for them to see for themselves the work that has been done to renovate the Vocations Centre, both that paid for by the diocese and the rather more extensive renovation carried out thank to the generosity of our benefactors. It was also a great opportunity for them to meet the Vocations Team and to get some insight into the work that goes on here. Last Saturday the Vocations Team and a group of young adults they have gotten to know from Canterbury hired a minibus and made their way into London to take part in Nightfever at St Patrick's Church, Soho Square. Nightfever began in Cologne after the 2005 World Youth Day and has caught on in various cities across the worls since then. In the United Kingdom there is a national coordinator and it takes place regularly in London and Scotland with the number of venues increasing all the time. The formula is very simple. As far as possible the Church is illuminated by candles and the Blessed Sacrament is exposed. Priests are available for confessions or simply to talk with whoever might want a conversation with them. Young people go out into the local streets in pairs holding a lantern and with a number of unlit candles. The approach passers by and invite them to light a candle in the Church. If people agree they are led up to the front, before the Blessed Sacrament, shown where to light the candle and invited to stay as long as they like. It takes courage to approach complete strangers on the streets - and in Soho you never know what you will encounter - but slowly the Church began to fill up. Some people stayed for a few moments while others were there for much longer. By the time Fr Alexander gave benediction at 11pm the Church was filled with young adults who had come to Soho - a symbol of God's absence - looking for buzz and excitement and had found instead a deeper thrill that can only be given by the Lord's Real Presence. The Vocations Team travelled up to Birmingham for the recent vocations event at St Chad's Cathedral. We were supposed to get there on Friday evening for the reunion of all those who had attended the Invocation Pilgrimage to Rome last July. As things happened the 'advance party' who left here at 11am on Friday morning got to St Mary's College, Oscott in plenty of time. The second car, however, which left the Vocations Centre at 2pm encountered a series of accidents and, after a series of radio announcements presaging more Friday evening difficulties, turned back two hours later having travelled no more that twenty miles and left instead at 6am on Saturday morning. The roles were reversed on the way home when the second car got home by 11pm and the first one - having made the mistake of stopping for a bite to eat - got back at 2.00am! Recently the Vocations Team helped Bishop Pat with his Year of Faith catechesis for young people of the South Eastern part of the diocese. Planning the event, it was decided that testimonies from some young people would be a very effective way of reaching out to other people of a similar age. Will Vecera spoke about his experience in Afghanistan and what had brought him to begin to explore a vocation to the priesthood. Later in the afternoon John Withers spoke about the experience of being a young Catholic at university. Bishop Patrick split his catechesis into three sessions, engaging the young people present and showing himself keen to answer their various questions. The day took place at St Saviour's Church in Lewisham where we were made very welcome by the parish priest and parishioners. Music was led by deacon Javier from the parish, who is also chaplain at Christ the King Sixth Form College, and we were also entertained by no less than three Gospel Choirs from the area. The day ended with a period of Eucharistic Adoration and Benediction led by Fr Stephen. It is never easy to judge these events but the fact that the Church was fairly full and many of those present asked if we could do it again suggests that it was a very successful day. To understand the Vocations Centre and its work it is really worthwhile visiting us. Yesterday we were able to welcome Bishop Patrick Lynch and the deans of the South East area of the diocese. They used one of the rooms for their meeting and then gathered in the common room for a presentation on recent developments in Vocations Ministry. Afterwards they were able to stay for lunch. Visiting the Centre not only helps priests understand better what we do here but also, we hope, helps them see the importance of their role as Vocation Promoters throughout the diocese. It is not unusual for a follow-up call from one of our visitors introducing us to a young man from his diocese as a potential candidate for the priesthood. Today we welcomed Fr Michael Branch, the parish priest of Woolwich, to lunch. Afterwards he spoke to us in a get-together of his own journey towards priesthood and about the joy of being a priest. It was great listening to his moving testimony. The joyful witness of priests is the best way to promote vocations. It is irreplaceable! Before too long we hope to be able to offer an open day to all our benefactors. Watch this space! We have been very blessed at the Vocations Centre to have a wide variety of lecturers give up their time to introduce our students to the fundamentals of philosophy and theology. Apart from seventy classes on the Catechism of the Catholic Church, we have had training in apologetics and engaging with the questions people have these days. We will also have introductions to Sacred Scripture, to Christology and Ecclesiology, to epistemology and to Church history. It must be a bit disconcerting for our lecturers, however, to have to deliver their classes with the Holy Father peering over their shoulders. If Fr Tim Finigan in the photograph above is looking a bit intimidated at first, he soon got into his stride and warmed to his topic with his usual clear delivery and good humour! Bringing together a load of dedicated young people is a bit like lighting the blue touch-paper and standing back to see what happens. Recently Michael came up with the idea that if the Holy Father wanted us to go out and evangelise then he should come along too. A few days later the doorbell went and a somewhat bemused delivery man stood there with an enormous flat box. With great excitement it was opened to reveal a life-size cut-out of Pope Francis himself. The next day he was hopping on a bus to attend a series of Freshers' Fayres at both the university of Kent and Christchurch university. He certainly proved a hit with students pausing to have their photograph taken with the Pope or give him a "high five". And all the while those manning the CathSoc stalls were able to harvest record numbers of new names. September was a busy time at the Vocations Centre as we went through our month-long induction for the new Vocations Team. For four weeks the six team members received an intensive formation to help them as they prepared to embark on a series of evangelisation projects. In addition to formation in the faith - which included training from 'Catholic Voices' - the programme has included a considerable amount of spiritual formation with daily meditations and classes on different aspects of the spiritual life. We have also had 'taster' experiences of the various types of evangelisation projects we will be involved with, including the preparation and delivery of retreat days, speaking at parishes and engaging with university students. Our day begins at 7.30am with half an hour of prayer in our newly decorated chapel. On Thursdays the prayer is done during a period of Exposition of the Blessed Sacrament. Holy Mass follows just after 8.00am. After Mass we have a quick breakfast followed by time to tidy up the house and to do some spiritual reading before classes begin at 10.00am. Lunch is at 1.00pm after which we have a short visit to the Blessed Sacrament before meeting in the common room for a get-together. Sometimes there are classes also in the afternoon although more usually it is free for manual labour and study. Whenever suits the individual there is another half-hour of private prayer in the Chapel or elsewhere and the team prays the Rosary each day either individually or in groups. We have supper together at about 7.00pm. The afternoon and the evening periods are also good times for us to prepare the talks and testimonies we gig when we are engaged in evangelisation projects. A get-together after supper helps us share our experiences and reflect on how things have gone. At 10.00pm we meet again in the Church for the Examination of Conscience and Compline. During the week Tuesdays is a 'House Day" when we don't have external classes apart from a fortnightly class on spirituality. It is also a day for the team members to meet with their Spiritual Director and confessors. The House Days give us more time to spend in prayer and to rest in the Lord's presence. About once a month we also have a group excursion which helps us grow together in our fellowship as disciples. There is also a monthly day of recollection which is open to any lads considering the priesthood as well as a monthly "Frassati Society" meeting for anyone we meet to join us for a period of Eucharistic Adoration and catechesis followed by a meal. In the posts that follow I'll try to give a flavour of one or two of the things we have been up to recently. For more up-to-date news Tony, one of the team members, posts regularly to the Southwark Vocations Facebook page. On Saturday 2nd November the annual Discovering Priesthood Day will take place at St John's Seminary, Wonersh. It starts at 10.00am and ends at 5.00pm and is a wonderful way of introducing the seminary to men considering a priestly vocation. For more information please contact Fr Terry martin, the Vocations Director for the diocese of Arundel & Brighton. Since Sunday 1st September the Vocations Centre has been home to our new Vocations Mission Team, photographed above with Gregory Treloar, one of last year's residents. During September the team is undergoing an induction month before it begins a programme of visiting schools and parishes to speak to other young people about the demands of Christian discipleship. The programme at the Vocations Centre consists of formation form mission at various different levels.. If you would like members of the team to come to speak at your parish or school please email the Vocations Office. Zenit, the Vatican news agency, recently carried the following article on our Invocation pilgrimage to Rome. The original can be seen here. The pilgrimage group was organized by Invocation – an initiative begun three years ago to offer an environment where young people from England and Wales who feel they might be called to the priesthood or religious life can discern their vocation. One of the organizers of the pilgrimage was Fr. Stephen Langridge, chairman of the vocation directors of England and Wales, and vocations director for the Archdiocese of Southwark. Speaking with ZENIT, he explained how "often, young people are invited to vocations events, and in a sense it's a step too far – sometimes they just need space to think and reflect without any pressure being put on them." "Invocation exists," he said, "to create that space for young people to give them the context within which they can pray and reflect, to give them the opportunity to meet other young people, to be inspired by other young people, to make friends with other young people, and to have the questions that they might have answered." Despite decades of lagging vocations, in recent years vocations in England in Wales have been on the rise. Fr. Langridge cites World Youth Day (WYD) as contributing to this increase. "Over recent WYDs, more and more young people have just gone to WYD independently… but it's had a big effect on them. That desire to be better disciples has created within them a desire also to answer the question: What the Lord is asking of them. It becomes safe to ask that question, and they have the courage, then, to answer it." The pilgrimage from the UK gathered young people in various stages of discernment – ranging from those who are in or are about to enter seminary, to those who simply wanted to participate in a pilgrimage to Rome. Fr. Langridge said he was most struck by the "number of people who have come [on the pilgrimage] a little bit scared, thinking that perhaps the Lord is calling them: how are they going to tell their parents? And two of them have said to me: 'I've decided. I'm going to respond.'" One of the participants in the pilgrimage was Chris Stowell, a young man from Sandwich, England, who is currently discerning a religious vocation. Raised in a Catholic family, he told ZENIT: "I'd always been sort of drawn to it, but I'd never seriously thought about being called as a priest." Stowell had attended various Invocation events, and next year intends to enter a discernment center, run by Fr. Langridge, to determine whether he is prepared to make the next step in his life. Over the course of a year, he and five other young men who are discerning the priesthood will live in community, praying together for three hours a day. Although it is only as recently as this past Easter that he has taken more definitive steps in his discernment process, he said that the process of "conversion" has been taking place throughout his life. "I don't think it's a 'one big moment' thing: I think it's something that happens your whole life, and you build up, and often the times when God is working most hard is when you don't notice Him." "I think it's important to think of who you want to be," Stowell said. "Whereas before I had always thought I couldn't be fulfilled without having a family, maybe if this is what God is wanting me to do, maybe He will give me the grace. Then this Easter, I thought: this could be me. I could be a priest. And it's just making that positive choice for Christ." Zenit can be received by email. Simply subscribe here. I will be in Walsingham and I am hoping to see you there! Have you been to the Youth 2000 retreat that takes place there every year? If not why not join us this year. Walsingham is a special place - it is known as England's Nazareth and is an ancient place for Catholics to go on pilgrimage and also more recently for some Anglicans as well. The annual Youth 2000 retreat is hard to describe to someone who hasn't been there before. It is a time of encounter with Christ where evangelisation gives birth to conversion. It is a time of catechesis and discovery of the faith. It is a time to take stock of one's life and resolution for the future. It is a time of prayer. It is a time also of fellowship and friendship with other young Catholics. This year's festival takes place in the wake of Pope Francis' first ever World Youth Day and so it is also a time to re-live those incredible moments and to share them with others as well as to reflect on and allow ourselves to be challenged by the powerful messages he gave in each address in Brazil. If you haven't booked your place why not do so today. There are coaches going there from most parts of the country. You can get all the details on the Y2K website. If you are Blog or are on Facebook or Twitter please re-tweet or share this post so that we can reach as many young people as possible. I look forward to seeing you there! Last weekend I had the pleasure of visiting the Church of the English Martyrs in Strood where the parish priest, Fr Bill Keogh, had invited me to preach about vocations. It is always nice to have the chance to celebrate Mass in the parishes of our diocese and I am always very struck and moved by the warm welcome I receive both from the parish clergy and from the parishioners. 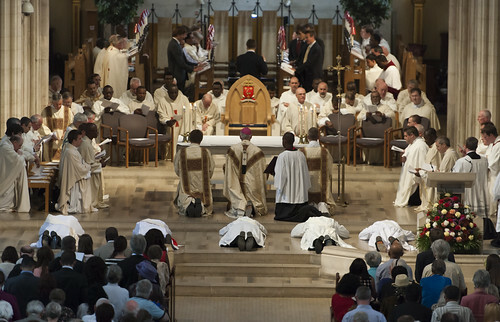 I have the impression most people are moved to joy at news such as the ordination of five new priests for the diocese and also that they really desire to have more priests. On these visits we try to have whenever possible a second collection for our work here at the Vocations Centre. This is important and is a big help to us - next year we will have eight hungry mouths to feed! - but above all people are willing to commit themselves to praying for our work, asking the Lord to send us more priests here in Southwark. I very much hope to continue these visits next year but am also pleased that our Vocations Mission team will also be able to go out in pairs to let people know what is happening in Southwark and to ask for more prayers for our work. Don't forget that you can commit yourself to praying regularly for vocations in Southwark or your own diocese by joining the Invisible Monastery. Click here for more details. I would ask your prayers please for a new project here at the Vocations Centre. Next year we will have eight young men living here forming our Vocations Mission Team. They will receive formation in the faith, in the spiritual life and in community living. What will set them apart from other similar projects, however, is that they will also go out to evangelise in schools, parishes, universities and on the streets. Pope Francis says it is not enough to open the door in welcome we have to go out through that door in order to take Christ to others. The plan is for the experience of a year with our Mission Team to ensure that evangelisation becomes part of the DNA of our future priests. Called to proclaim the Gospel – Dear Bishops and priests, many of you, if not all, have accompanied your young people to World Youth Day. They too have heard the mandate of Jesus: “Go and make disciples of all nations” (cf. Mt 28:19). It is our responsibility to help kindle within their hearts the desire to be missionary disciples of Jesus. Certainly, this invitation could cause many to feel somewhat afraid, thinking that to be missionaries requires leaving their own homes and countries, family and friends. God asks us to be missionaries wherewe are, where He puts us! Let us help our young people to realize that the call to be missionary disciples flows from our baptism and is an essential part of what it means to be a Christian. We must also help them to realize that we are called first to evangelize in our own homes and our places of study and work, to evangelize our family and friends. Let us help our young people, let us open our ears to their questions, they need to be listened to when in difficulty; of course patience is needed to listen, in confession and in spiritual direction. We need to know how best to spend time with them.